IT’S HARD TO BELIEVE it’s been over a decade since Diablo II came out. How is that possible? I remember so many nights at the GameSpy offices where we had a regular crew playing the beta for weeks on end, and then who knows how much more time we spent hacking and slashing through the final game. 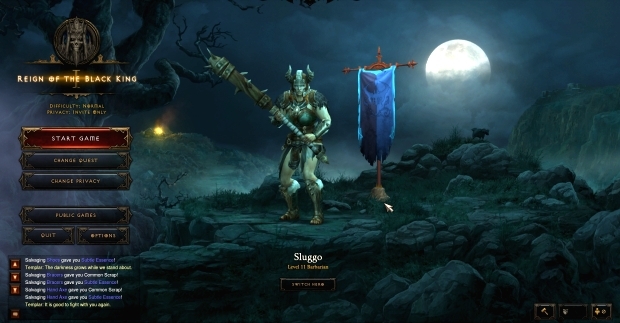 So naturally I was excited when I got a chance to take a whack at the Diablo III beta. Before you get too jealous, understand this: the beta is not that long, just a piece of Act I that you can blast through in three or four hours. It’s basically one large story arc in four parts, culminating in a long dungeon crawl through (well, under) a cathedral. Still, it was pretty nice to dive back into the world of Diablo and start beating stuff up again, now in glorious hi-def. It was my experience with Diablo that led me to pick a warrior as my first WoW character, so of course the first character I started was a Barbarian. (I like to hit stuff. Sue me!) All five of Diablo III‘s hero classes are available to play around with, including the Monk, Witch Doctor, Demon Hunter and Wizard, and I assume it won’t be long before I try a few of the other classes. 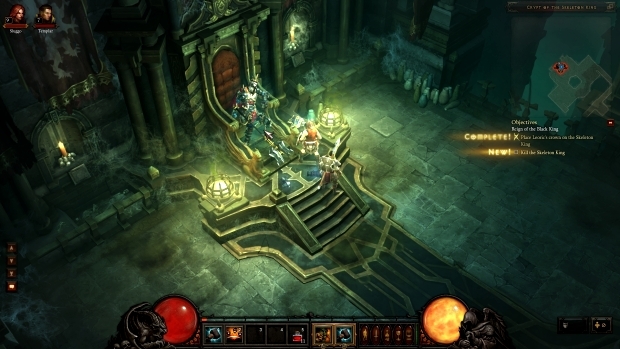 Act I contains two quick nods to previous Diablo releases: it starts in the town of New Tristam – built upon the ruins of Tristam from earlier games – and a lot of the action in the beta centers on a search for NPC favorite Deckard Cain. You’re sent on this quest by his adopted daughter, Leah, who occasionally accompanies and fights alongside you. Playing as the Barbarian is as straightforward as it gets. The usual array of zombies, witches, or minions come out of the ground, you whap them in the face, and you get loot. You’ve got your health orb in the usual place, and the Barbarian’s attacks fill a “Fury” meter, used to power special moves. As you level up, you occasionally get to select new moves to add to your arsenal, but you’re not permanently locked into them; at level 2, I could choose between one of three moves, but by using a altar in town (I also ran across a few in dungeons), I could exchange that ability for a different one. I was fairly amused when people initially freaked out over Diablo III‘s art style, because… really, what were the odds the game was going to be bright and happy and filled with rainbows? Yeah, there are plenty of colorful effects, but as you can see by the screenshots here or anywhere else (there’s no NDA on the beta now, BTW), it’s still a Diablo game, with dark outdoor areas and dark dungeons and dark cellars. Did I mention it’s dark? If anything, I was happy when I got to the final boss of the beta and he actually had a few bright colors in his getup. One interesting aspect of the beta I hadn’t expected to be up and running was the auction house. It’s not accessed in-game, but from the character menu. The way it works is that all your characters have a shared “stash” they can access, which you can use to transfer loot from one character to another, or to list or buy items from the auction house. After completing the beta and then going back for a second tour, I still hadn’t gotten a single piece of shoulder armor for my Barbarian, so I bought a piece off the auction house for 1500 gold (I was already sitting on 6000 by that time), sent it to my stash and sent it to my bruiser. Really, there’s not a whole lot to say about the beta, other than the most important thing: that Diablo III seems to retain the essence of the series, being a massive loot pinata where you beat the crap out of everything in sight. You’re justice in bulldozer form, cleansing the world of evil (and gear and gold) as you go. With updated graphics, new classes to play with, and other diversions like crafting, I say: bring it on.